Latest For the Birds column: Chickadees, scarce or not? 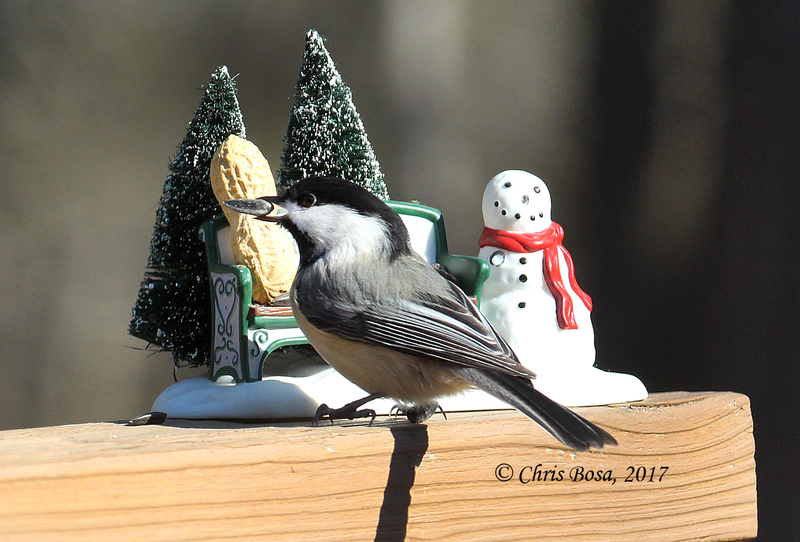 A black-capped chickadee grabs a sunflower seed from a Christmas decoration during the winter of 2016-17 in Danbury, Conn.
That question has been on the minds of many concerned birders this winter. I’ve been lucky enough to see a few at my feeding stations, but not great numbers. Consistent numbers, but not big numbers. Titmice? Those I’ve seen in consistently high numbers. Nuthatches and the downy woodpecker — also consistent and high. But chickadees have been harder to come by. As I said, I’m one of the lucky ones. I’ve at least seen a few. Many people have written to me to say they’ve not seen any. “What has happened to these birds?” one reader asked. Chickadees are a beloved bird in New England and have always been plentiful, so a dearth of them reported by many people is cause for concern. Not necessarily alarm, but concern, for sure. The New Hampshire Audubon has also fielded a lot of questions regarding chickadees this winter. While data is not yet available for its New Hampshire bird survey (similar to the Great Backyard Bird Count), the group does offer a possible explanation or two for the apparent lack of chickadees this winter. One possibility is that the chickadees in Canada that typically come down a bit south in the winter are finding enough food up north. Or, perhaps the opposite is true, and the chickadees that live in New Hampshire have left the state for the winter and flown south. The organization also noted that natural food crops of berries, seeds, nuts and cones were strong this fall, potentially mitigating the need or desire to visit feeders. It did note that Christmas Bird Count numbers showed a typical amount of common feeder birds — except for chickadees. Christmas Birds Counts are held in December and data is typically available by mid to late January. Great Backyard Bird Count data should be available soon for analysis. On the positive side, the New Hampshire Audubon noted that it does not know of any mortality event that would have impacted chickadees. Phil Brown of New Hampshire Audubon, and the compiler of the Keene Christmas Bird Count, noted that a research project is currently going on looking at chickadee numbers. Numbers are not available for that project yet either. I’ll also keep my eyes and ears open regarding chickadees and I’m sure you will, too. Let me know what you are seeing out there. Lots of chickadees, no chickadees, normal amount of chickadees? Hopefully, they just flew a bit south for the winter. With two nor’easters in March already and no significant warmup in sight, who could blame them? This entry was posted in backyard birding, For the Birds column and tagged Black-capped Chickadee, chickadees by Chris Bosak. Bookmark the permalink. I haven’t seen may chickadees at my feeder this past winter, but they are abundant in our back yard bushes and trees. So many feeding in our back yard. At first I was also worried about the scarcity of them at the feeder, but they seem to have enough food naturally in the woods this winter. I too, noted a decrease in the number of chickadees this year both in NH (Marlborough) and CT (Milford). Nuthatches and tufted titmice were at average levels while juncos were more prevalent. The oddity was the dearth of sparrows in both locations. None at all this winter in NH and very few in CT. I have read your last two articles concerning the reduced chickadee numbers. Our feeder station has not seen any reduction of their numbers. We live at elevation in Rindge. Chickadees, Titmice, Nuthatches, Hairy and Downy Woodpeckers all seem to be of abundance this year. We also have a feeder on the Franklin Pierce University campus. There have been plenty of White Throated Sparrows there. As well as all the usual winter guests. Plenty of Goldfinch and Cardinals. The abundance of Juncoes this and last year, has been remarkable. They never had used the feeder itself before. They were always satisfied with just cleaning up underneath. Now they are dripping from iit all day. P.S. The Turkey Vultures are back!